You have just finished an awesome, sweaty, pumping workout. Now you must decide what to eat and refuel your muscles. There is no set rule for how I eat meals I tend to mix and match what is in the fridge and what suits my needs at that time. My plate can look like a pick ‘n’ mix bag. Load your plate up with veggies, make it look like a kaleidoscope of colours. This post contains three post workout recipes to help you stay on track to achieving your health and fitness goals. The biggest nutrition myth in my mind is the idea that a person must consume protein within 30 minutes of exercise to see muscular adaptation from that exercise bout. Although this is known as “fact” in many circles, the scientific basis for such a claim has little data to support it. In fact, the idea that all muscular gains are lost 30 minutes after completing an exercise bout unless food is eaten doesn’t seem to make sense from any biological perspective. Esmarck et al. 2001 is the most commonly used citation to support this “window of opportunity”. That study took older untrained men (74 years) and had them resistance train for 12 weeks. One group had 10g of protein immediately post and the other group had 10g of protein 2 hours later. The group that had protein immediately post exercise saw increases in muscle size, however, the other group saw no change in muscle mass. The fact that one group exercises for 12 weeks and saw no increase in muscle mass whatsoever should be a red flag because resistance exercise has been shown to increase muscle mass in numerous studies (elderly included) not giving protein immediately post exercise. Recently, a well-controlled study by Erskine et al. 2012 presented data in untrained healthy men (23 years) who worked out for 12 weeks. One group consumed 20g of whey protein immediately post exercise and the other group consumed a placebo. In addition, participants were instructed to consume only water in the 2 hours before and 1.5 hours after each training session. What they found was that the muscle size and strength gains following exercise were identical between groups. This means that consuming protein immediately post exercise did not offer any additional benefit. The point I am trying to make is that there is nothing magical about placing all of one’s focus onto one meal during the day. There is nothing wrong with consuming protein immediately post workout, however, it is important to understand that it will not hurt ones muscle gains if they wait until they get home or even later to eat a meal. The focus should not be on one meal, it should be on all meals. A person should focus on consuming adequate protein, carbohydrate, and fat at each one of their meals. Specifically, one should focus on maximizing their muscle protein synthetic response about every 4 hours and recent data suggests that distributing protein evenly throughout those meals is beneficial. I would then place their training between anyone of those meals. I would recommend that they work out anytime between Meal 1 and Meal 4. This strategy focuses on hitting sufficient macronutrients at all meals not just one meal. In conclusion, there doesn’t appear to be anything magical about consuming protein immediately post exercise for improving muscle size and strength. However, although the data doesn’t support this “window of opportunity” it will undoubtedly stick around as “fact” by those who wish to believe it to be true in the face of evidence directly to the contrary. Remember that all meals are important, not just the post-workout. Esmarck et al. “Timing of postexercise protein intake is important for muscle hypertrophy with resistance training in elderly humans.” Journal of Physiology (2001), 535.1, 301-311. Erskine et al. “Whey protein does not enhance the adaptations to elbow flexor resistance training.” Medicine and Science in Sports and Exercise (2012), 44(9), 1791-1800. “To enjoy the glow of good health, you must exercise”, Gene Tunney. 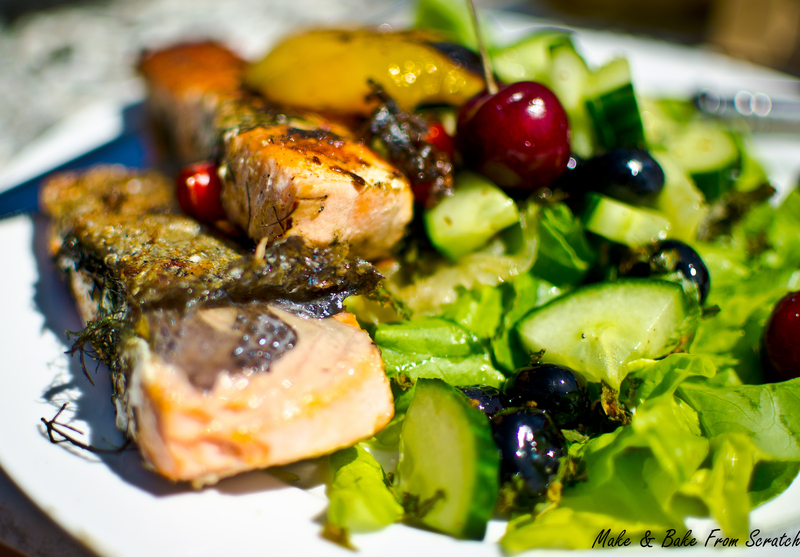 Lin foil with coconut oil, place salmon on top and season with salt, pepper and lemon juice. Place on a baking tray. Bake for 12-15 minutes until salmon is cooked thoroughly. Cut yellow/red pepper into chunks and place under a medium heat grill. Allow to soften and brown. Cut into strips for the salad. Next, place 1 tbsp. flaked almonds on a baking tray and toast until lightly brown, set aside until ready to serve. Wash and chop all salad ingredients and place pop onto your serving plate. Salad Dressing: Pop all ingredients except orange slice in a bowl and whisk until rice syrup is dissolved and emulsified. Add orange slice at the end. Season with salt and pepper. Set aside and serve with meal. Spoon it over your salad. Store any leftover dressing in a glass jar in the fridge. Once everything is ready , plate up and nourish your body. This post workout Smoothie is great to help way to replenish your muscles. It contains pumpkin, banana, coconut water, raw cacao and cinnamon. To boost the protein content you could add a scoop of whey isolate protein (chocolate or vanilla flavour) or one raw egg. A brand I am fond of in South Africa is Absolute Organix they sell a whey isolate or a raw vegan protein powder. If sourcing pumpkin is difficult use sweet potato puree as an alternative. Sweet Potato puree is made the same way as pumpkin puree. You can store it in the fridge in an airtight container. It works really nice in coconut flour pancakes too. Eggs are a great addition to your fridge. They are very versatile and can used in sweet and savoury dishes. Basil Omelette: Pop eggs, basil and seasoning into a food processor/blender and blitz until combined. On a medium heat pan, melt ½ tsp. coconut oil and pour omelette mixture into the pan. Cook for about 4-5 minutes or until the egg is set and firm, toss some goats cheese on top. Place under a medium heat grill and lightly brown the top of the omelette. Grilled Tomatoes: Line an oven dish with tin foil and pop in a handful of cherry tomatoes. Place under the grill at medium temperature and grill tomatoes until they blister. I like to brown the skin. I love the taste. I usually store any leftover tomatoes in an airtight container in the fridge and use them in salads. Coriander & Basil Pesto: Chop chilli and peel garlic. Pop all ingredients into food processor and blitz until combined. Pour into a glass jar and store in the fridge until ready to serve. It will keep in the fridge for a week and you can add it to salads, chicken, beef or your favourite fish. I like to mix it into my cauliflower mash for extra flavour.